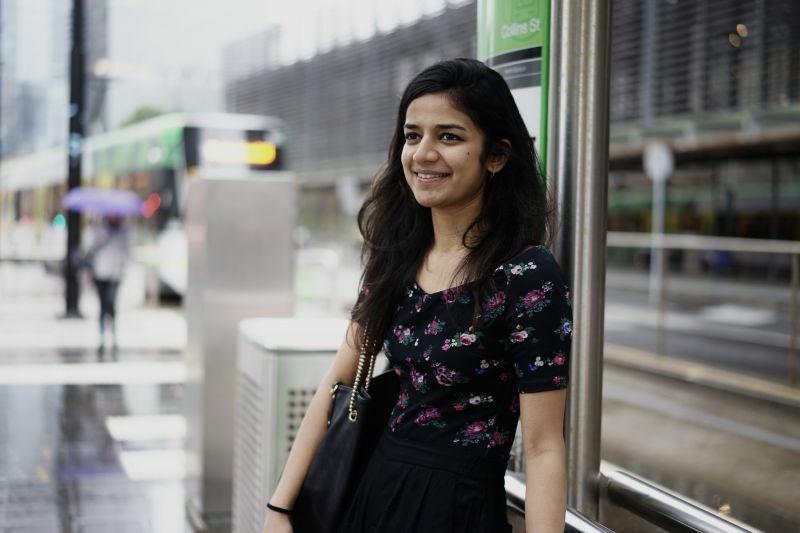 Deloitte graduate analyst Harini Warrier from Mumbai shares what she loves about the world’s most liveable city, and how her Melbourne Business School experience has shaped her career. When she isn’t exploring the uses of big data in financial services from her Bourke Street office, Harini Warrier enjoys discovering the many sights and sounds that Melbourne has to offer. Originally from Mumbai, India, Warrier moved to Melbourne for her Masters degree, and these days, is an analyst with Deloitte Financial Advisory. After much careful research into the various benefits that a graduate degree from Melbourne Business School (MBS) has to offer, Warrier packed her bags for Melbourne. The factors that convinced her? The international reputation of MBS, and the range of study options available to Masters students. “The Master of Management (Finance) meant I could benefit from learning general business as well as core finance disciplines, thus keeping my options open for both more technical roles and also high-level consulting options,” says Warrier. Here’s what she has to say about her experience with MBS, her current work, and what excites her about Melbourne. What was it like to be a Masters student at MBS? Needless to say, I gained technical, business and professional skills through my degree. For example, my capstone subject taught me how to financially value a company purely from publicly available data and sources. The amount of time and interest the professor teaching the class awarded to our strategy, beyond the technical scope of the course, has truly shaped how I work in my role as an analyst now. However, what I cherish most about being a student at MBS is the people I spent time with. The relationships I have built with our Deputy Dean, academics who led my classes, and most importantly, my fellow students, are ones I know I will keep for life, regardless of where I go. That’s great! You were also quite active with extracurricular activities, weren’t you? Yes, I was! I was an event manager with the MBS Student Association (MBSSA) and a member of the MBS Sports Club. One of my most enriching experiences of my life so far has been organising, and participating in, the MBS Case Competition! Working on our case allowed me to improve on my academic skills, but building rapport with my team members and mingling with the industry partners present during the competition really developed my soft skills, such as networking in a professional environment. Another great event was the scavenger hunt, also organised by the MBSSA – it was great to discover the little gems around University and Melbourne’s CBD and then relax with friends at a quiet bar in the evening. And what was your experience with looking for a job like? While I must admit that trying to land a job as an international student in Australia has been one of the toughest experiences of my life, my MBS heritage was a natural advantage. Given how important first impressions are in the professional world, I knew my time at MBS was positively looked at when both my personal interview and introductory email to the team were centred around the various roles I’d held and awards I’d received at MBS. In fact, I’ve even had colleagues tease me, good-naturedly, about how much more well-prepared I am than when they had started, when I’ve been able to point out that a piece of work I’m doing is so similar to what I’d studied during my Masters degree! I’m glad MBS has been able to do this for you! What about your time outside of University? What can you tell us about your life in Melbourne ever since you moved here? Well, Melbourne’s made me an absolute coffee junkie! I love the little laneway coffee shops that pop up where you’d least expect them. Melbourne is famous for its food scene, and my comfort food was, and still is, the Japanese Don Box at Don Tojo down Grattan Street followed by a gelato from Pidapipó along Lygon Street. The best thing? They’re both within walking distance of the University! I’ve also cashed in on all the activities and events that Melbourne hosts – from the Grand Prix to book-reading sessions, to witnessing the giant NGV-hosted Dominoes falling across the city. My absolute favourite so far has been the secret city tour, En Route, a pedestrian-based live art event, where I was guided through the city through audio, mobile phone communications. People often talk about how much culture matters and Melbourne is a living example of that. This city has a way of making you feel like you belong, no matter where you’re from. Melbourne Business School runs information days in cities all over the world. Find out more about our programs at our next Education or Information Fairs!